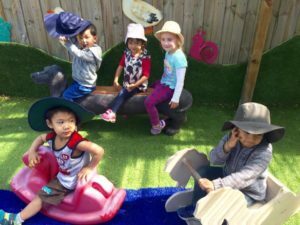 Welcome to Jacobs Early Learning Centre – the name of quality child care in Rowville, Melbourne. We are one of the premier child care centres in Rowville with a passion for nurturing the next generation from a very young age. As a locally owned independent early learning childcare centre, we are able to provide better care of our children than a corporate childcare company can. At Jacobs, we provide age-appropriate, safe, and stimulating programs for children up to five years. Our programs run by highly qualified early learning childcare educators, help children to be focused, happy, and adaptable to situations. Our family daycare in Rowville help them to play, learn, make friends, laugh, and explore the world around them. Experience the best program designed for your child in our early learning childcare centre. Do you want to see your child engage with playmates, have fun, and learn while you’re at work? Are you searching for quality and affordable daycare options around Rowville? At Jacobs, we ensure personalised care and attention for children between 0-5 years of age. Provide high-quality long day-care in a play based educational environment. To exceed parents expectations and provide exceptional care and learning in a nurturing environment. Click here to: Explore Our Rowville Centre. At our early learning centre, we create a fun-filled environment for your child that encourages education and activity. We classify the children based on their age groups and offer them specific fun games and activities developed to engage their age group and personalities. As a leading child care centre in Rowville, we develop games and activities to help children become aware of the world around them. We educate around dining etiquette, proper brushing procedures, personal hygiene, and much more through games and fun activities. Our activities teach the children appropriate behaviour and organisation and support and encourage physical activity for the growth and development of strong, healthy bones and muscles. Our programs and activities are carefully crafted to improve the concentration of children and to encourage independence while nurturing life skills. We are committed to developing programs that offer a foundation for lifelong learning. Several studies show that early education significantly influences brain development in a positive way. We support and embody this theory. At Jacobs, we focus on encouraging the potential of our children. We provide them with materials, toys, and structures designed to stimulate their senses and work independently. For toddlers, we focus on motor skills and engage them in activities and programs that will enhance their fine and gross motor skills. As one of the leading family day care centres in Rowville, we offer your child an extension of the family environment with personalised care and attention that bigger, more corporate child care centres cannot. Our qualified educators build a positive relationship with your children and encourage them to showcase their potential. Our qualified educators identify the talents and interests of your child and help them grow. Highly skilled educators and teachers are fully attuned to child development and focus on improving the classroom experience. With an optimal educator-to-child ratio, flexibility, and support, Jacobs provides your child with a safe, stimulating and secure environment in which to grow. Call us today on (03) 9752 7436 to learn more about our facility, programs, and enrolment procedures. Feel free to connect with our staff online to learn how our programs can benefit your children. Jacobs ELC has provided nothing but a positive and nurturing experience for my son who has been attending since a very early age. He is fully breastfed and I was able to provide expressed milk, which was looked after like gold and now that he is a bit older his nutrition is still monitored to ensure he is getting a great variety during the day. I feel relaxed while I am at work knowing that his attachment needs are met with cuddles and guidance when needed, and companionship while going to sleep. They are so attentive to his growth and development with play based learning appropriate for his age but he is also able to safely mingle with the older children which he absolutely loves. My son is very happy and so am I, I'm very glad I chose Jacobs Early Learning Centre. Thank you for the many years of support. It is hard to believe that we brought an 8 month old here back in 2008. Thank you for all the changes you have made since taking over. Thank you to all the staff. We hope this plant flourishes like our children did under your care. We want to say thank you so much for the love and care you give us everyday. Thank you for looking after us, making sure our tummies are full, wiping our noses, taking us to the toilet, picking us up and cuddling when we fall, teaching us to read and count, teaching us good values and discipline, holding us tight when we just have to cry, play with us and do story times, sing and dance with us which we always loved. 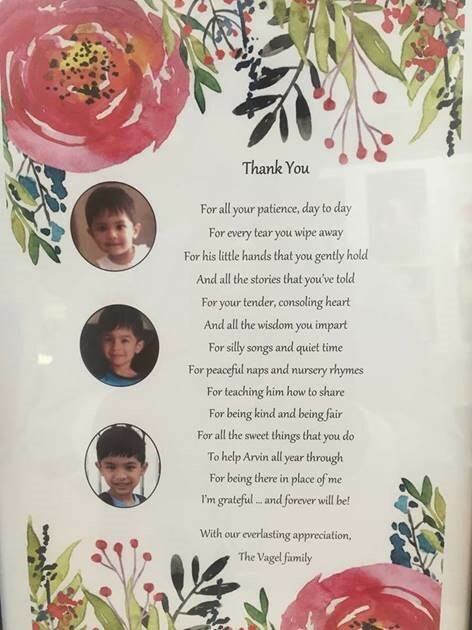 You have made our parents happy and have given the trust and confidence to leave us on your hands and to go to work with a peaceful mind knowing we've been looked after well. Thank you so much for everything and making a fine difference in our lives. I am very happy with the interaction and care that Hudson receives and he's always a very happy baby, it is comforting to bring Hudson to a Wonderful environment. I would like to thank you so much for the care you give Hudson. 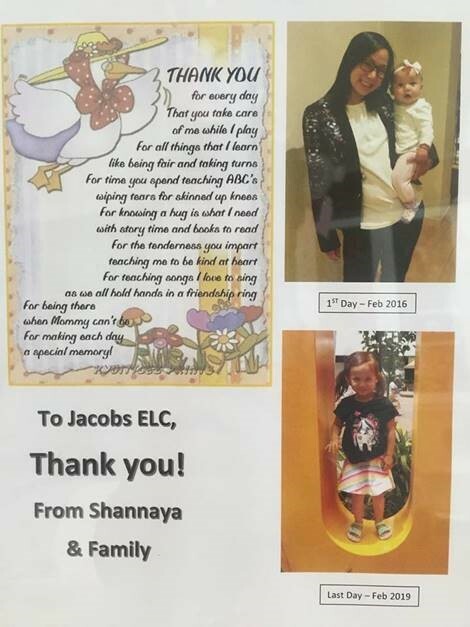 I just want to share my positive experience during last several years with Jacobs ELC since my eldest child used to go there and my youngest is still there. The centre is keen on providing very caring and learning environment which is a rare combination nowadays. My eldest child didn't go to kinder neither will my youngest go to because I feel the centre develop and implement different learning techniques and exercises which definitely help my eldest to be great at prep so far. I can highly recommend this centre to everyone, they've been amazing to the children in every aspect of their growth and development. I have been sending all my kids to Jacobs and I have never ever had any complaints or issues. The best center I have found! I highly talk about the staff and center and know my kids are safe in their hands. What else as parents do would we want?! I will keep recommending the center to everyone I know. Best wishes and keep up the good work. We start our first child, Mia, at Jacobs ELC when she was 20 months old. She had been in a daycare service prior to starting at Jacobs and from day one we knew we had made the right choice. Within a week of starting, her speech had taken off and she was learning things that we would never have thought to teach her, let alone had the time to teach her. Mia graduated from Jacobs ELC 6 months later and her younger brother Luka started attending 3 days a week. As with his sister, his communication skills have soared. He has become much clearer in his interactions and has been doing things, such as art and craft, that I, as a full time working mum, just don’t have time to do with him. I have always considered daycare to be school and this has never been more true when it comes to Jacobs ELC. I strongly believe that attending Jacobs ELC has set my children up with a fantastic foundation for the rest of their education. My daughter has been going full time since she was 10 months old and we have seen her learning to crawl, walk, speak and run and now play with the help of genuine careers from the center. We are very happy with her social, emotional, friendship and learning skills. We always feel peace of mind after every day, dropping her off and listening to her stories after picking her up. We are very happy, so thank you to the whole team! To the incredible team at Jacobs ELC! Thank you for caring for Winnie as if she was your own and for nurturing her little friendships too. Winnie is a very happy, healthy and confident little girl and we know we owe a lot of that to you.